Believe it or not blackout curtains were first made popular during World War II. It was believed that without any man-made light coming from city structures, bomber planes would have trouble navigating and reaching their targets. Nowadays blackout curtains are used in homes, hotels, cottages and a variety of other places. Despite their widespread use however, the fact remains that blackout curtains are simply not effective at blocking out sunlight and certainly not suitable for someone requiring total darkness for sleeping. Just look at the above photo - no matter how opaque the blackout curtain material is, all sorts of light will shine through the top, sides, and even the bottom! Yes, the curtains may come in all types of trendy styles, materials, and lovely colors but what good is it if they don't fully darken your bedroom?! It is for this reason that we decided to create our 100% blackout blind. Our blackout blinds are the only true blackout window treatments available on the market. Our blinds are made of a specially formulated vinyl material designed to block out ALL light. They also seal to your window using Velcro which, unlike curtains, blocks ALL sunlight from the top, sides and bottom of your window. The result - A totally darkened bedroom, perfect for sleeping anytime of day! So, if having a fully darkened bedroom is important to you, don't waste your money on blackout curtains! 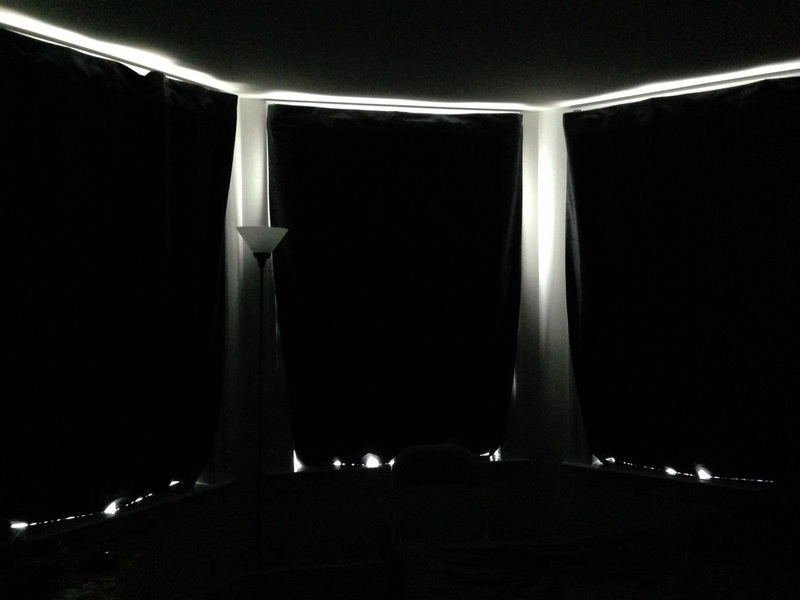 Give our blackout blinds a try instead and see the difference for yourself.